I've been a owner of an Oral B electronic toothbrush for many years. Replacing a manual toothbrush, which never worked very well for a lazy brusher. My mouth just never felt as clean after using a manual toothbrush as it did with my Oral B. Now now my Oral B electronic toothbrush is beginning to show its age. It now requires more frequent charging and the handle is worn and stained. So I jumped on the opportunity to purchase a set of Philips Sonicare toothbrushes while on sale. 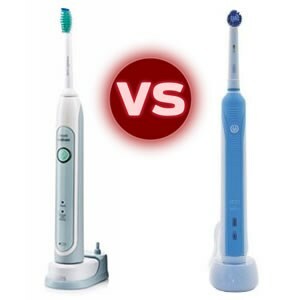 The main difference is the Sonicare toothbrush brushes much much faster than the Oral B. It's fast enough that there are studies that claim the Sonicare toothbrush can clean your teeth through the vibrations of saliva and toothpaste. This is an added benefit, as the Sonicare toothbrush will aid in cleaning between teeth (but does not replace flossing). The Sonicare toothbrush vibrates much more than the Oral B toothbrush. During my first week of usage, I noticed the vibration in my arm just as much as I did in my mouth. On the downside, I did feel more vibration on my teeth as well, but powered through it knowing my teeth were getting clean. A major dislike with the Sonicare toothbrush is if the non-bristle portion of the toothbrush touches my teeth, I can feel much more of the vibration. Unlike my old (very old) Oral B toothbrush which had a terribly designed timer that never worked properly, this Sonicare starts a fresh 2 minutes brush cycle each time I brush. This helps ensure that I brush long enough for clean oral hygiene. No toothbrush is perfect, but a feature I'm surprised that Philips left out of the Sonicare toothbrush is an automatic shutoff feature if the brusher applies too much pressure. I've read in various blogs that a major issue with electronic toothbrushes is too much pressure, which is bad for teeth by removing enamel. My thought was any new electronic toothbrush should have this feature. Apparently not. One option I really like about the Oral B toothbrush is the circular brush head, which feels much easier for difficult to reach corners of the mouth. Even though I've already becomes accustomed to the larger brush head of the Sonicare, I still miss it in Oral B. Overall, I honestly get cleaner feel after 2 minutes with a Sonicare toothbrush compared to the Oral B toothbrush. Though my teeth and gums felt a bit sore after the first few days of use, my mouth is now accustomed to Phillips Sonicare just after a few days. How Orange Juice Gets Consistent Flavor Throughout the Year?